After months of planning, the Altair/Sony team was thrilled to head to Barcelona for the world’s largest mobile event. This year, Mobile World Congress included 107,000 visitors from 205 countries and territories. More than 2,400 companies showcased their products – from multinational heavyweights to the smallest startups, and everything in between. 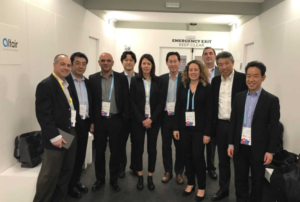 Altair sent a delegation of 15 executives to MWC, where we held 120 meetings with customers, partners, operators, analysts, and journalists. The non-stop, face-to-face meetings were exhilarating and valuable, and the feedback we received about our strategy and products was extremely positive. Cellular IoT is even bigger than we thought – Our meetings with top-tier IoT leaders revealed that they are targeting a larger cellular IoT market than previously planned. This includes development of a wide array of home and business devices that will be connected to cellular LPWA, as opposed to Wi-Fi, Bluetooth or similar technologies. These giants are looking for partners to create the optimal user experience at the right price point. According to the GSMA, 23 mobile operators have already launched 41 mobile IoT networks worldwide using the NB-IoT and LTE-M standards, and this number will rise steadily in the next few years. 5G is still premature – 5G once again took center stage at MWC, but we believe the hype is overshadowing the reality. While very limited 5G pilot projects will begin in 2018, wider deployment will take time. Current predictions are that 5G will cover just 34% of the global population – some 2.6 billion people – by 2025. OEMs are becoming increasingly influential – In an industry traditionally driven by MNOs, OEMs are now starting to play a more prominent role. The global market is opening up, thanks to the growing number of IoT applications and new technologies, like Altair’s OneSKU™ RF technology, which enables support of all commercially available LTE Cat-M1/NB-IoT band combinations on a single hardware design. OEMs no longer have to distinguish between different geographies. They can now develop and ship a vast range of products across the globe that can operate seamlessly on any LTE band combination in any location. Growing need to reduce market complexity – A common theme in our discussions was the need to make cellular IoT as easy to implement as Wi-Fi, in order to reduce entry barriers and time to market and enable billions of connected devices. To achieve this, integration is key. Companies across the IoT value chain are looking for simple, end-to-end solutions that will help them bring their products to market most effectively. We’ve long been touting the advantages of our solutions as the smallest, most cost efficient, lowest power and most integrated chipsets – and the market agrees. In meeting after meeting, industry experts were amazed that our chipset (smaller than a shirt button), packs in so many features, including GNSS positioning and a multi-layered security framework. Realizing new LTE IoT applications – Of the numerous applications demoed at MWC – from wearables and trackers, to smart clothing and more – two in particular were powered by our IoT chipsets: Sierra’s smart work boot to improve safety and save lives of industrial workers, and Ericsson’s eHealth concept for diabetes monitoring. We also showcased our LTE Amazon-like dash button, which can provide 10,000 clicks on an AAA battery (compared to existing Wi-Fi and LTE buttons that only provide 2,000 clicks) and includes an integrated GNSS. As LTE IoT becomes more ubiquitous, through integrated solutions and reduced price points, we expect to see a surge in new concepts and product rollouts across the board. With MWC 2018 behind us, we look forward to keeping you updated on our latest developments, many of which were discussed behind closed doors at the show. We’ll also be participating in the upcoming MWC Shanghai and MWC Americas events later this year, so please contact us to arrange a meeting with our teams on-site.